Posted on Sun, Mar 11, 2012 : 5:58 a.m. If anything has marked police and fire services in Ann Arbor in recent years, it’s been the combination of reduced staffing and rocky relations between the city administration and unions. Welcome to a new era. The transition out of recrimination and retrenchment continued last week when the city announced it has reached agreement on a new contract with firefighters. The pact includes the same kinds of savings in employee benefit costs that the city achieved in an earlier contract agreement with police officers. Less than a year ago, there were protests outside city hall over cuts to public safety. 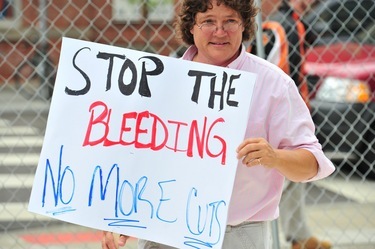 Here, Elizabeth Patten, an off-duty patrol officer, joins in a protest last June before a City Council meeting after four police officers were pink-slipped. For Ann Arbor residents, the most significant consequence of the contract settlement is the prospect that it could allow the city to avoid further layoffs in the Fire Department. Mayor John Hieftje called the contract a “breakthrough’’ and said it creates the potential to stave off cuts to fire service that had been forecast in the city’s next fiscal year, which begins July 1. We hope that’s the case. Based on the contract with the police union, the mayor already has said he expects not only to avoid cuts in police protection, but to be able to hire additional officers. Coming off a year in which City Council eliminated 20 public safety positions, on top of earlier cuts, it has become essential to stabilize the police and fire departments and prevent further staff reductions. Also encouraging is the improved relations that the new contract heralds between firefighters and the city administration. Fire Chief Chuck Hubbard spoke of the tremendous tension that he felt between the union and management when he took over the department. He said the contract settlement, which the parties managed to achieve outside of arbitration, has allowed the city to begin to “bridge that gap.’’ Hieftje also described the agreement as a “breakthrough in that relationship.’’ Legislation at the state level to control employee benefit costs and reform the arbitration process for police and firefighters certainly contributed greatly to the city’s ability to secure these new contracts. The result is a fiscal turnaround for the city and hopefully the end of an era of cuts in public safety. The next step for the city is to address response times for fire calls. A recent consulting report have found that the city does not meet national response time standards. With this new contract as a framework, we look forward to the city laying out for the public how it is responding to those findings and improving response times. At a time when we continue to see encouraging signs about the economy, we’re equally encouraged by news of Ann Arbor’s ability to attract new industry and jobs because of the talented workforce it offers. As we reported last week, unemployment in Michigan fell to 9 percent in January, the lowest rate since September 2008. On the local level, that improved picture is reinforced by announcements like the one last week regarding Commerce Guys, a technology company that says it will move to Ann Arbor and plans to grow its local workforce from 14 to 30 employees. The company, which currently has offices in Jackson and France, recently received additional venture capital funding of $5 million. Its e-commerce software is currently running on more than 10,000 web sites and it says it wants to relocate to Ann Arbor because our city offers a better opportunity to recruit the software developers it needs to continue its growth. While the upswing we’re finally seeing in Michigan’s economy is being driven by the recovery of the auto industry, we know that we’ve relied too much on manufacturing in this state and that we need to continue to diversity our employment base. Every new sign that technology companies see our region as a good place to locate and expand their operations is a welcome one. Sun, Mar 11, 2012 : 10:41 p.m.
As usual, lots of questions spring from the content of this article. Just a suggestion: multi-subject articles with one head line are a &quot;false economy&quot; because: Ann Arbor police &amp; fire is supposed to be the main story but dragging in &quot;relationships&quot; between city and city service personnel only invites political debate (which in turn is always non-productive). Then dragging in the putative economic recovery (9% unemployment is STILL 133% over the optimal level) makes one think this is just a Rah-Rah! pitch cloaked as &quot;optimism.&quot; Tossing in mention of a new company arriving in town - looks like more over-hype for the &quot;recovering economy.&quot; Finally: asserting the OLD BALONEY about the need to shift away from manufacturing borders on idiocy. This is a Republican propaganda ploy designed to deflect rage against off shoring by (putatively) &quot;American&quot; companies. Just to clarify: there never was a &quot;need&quot; for American workers to &quot;compete&quot; with foreign workers. NEVER! It was an arrangement made between American companies and foreign companies to allow greater penetration into BOTH American and foreign markets that led to NAFTA and other similar &quot;treaties.&quot; So it was ALL based on corporate greed - coming from both U.S. and foreign companies. The pitch to us was that we could buy goods cheaper - NOT mentioning that meant cutting INCOME for millions of Americans. We got SCREWED - as so often happens when millionaires do all the talking. Sun, Mar 11, 2012 : 3:05 p.m.
Mayor John Hieftje and the former city manager were the cause of the 'rocky relationship' with their bashing and insults of hard working police and fire staff. I doubt if this agreement includes any apology from our Mayor for his past words and actions. The mayor, as always seems to think speaking out on important issues like the parking fees for the giant puppet head parade, which he did at the last DDA meeting, is somehow great leadership. Respect for city staff is leadership, a quality Hieftje is sadly lacking. Sun, Mar 11, 2012 : 7:37 p.m. The mayor is happy. The job was just greatly devalued. How could he not be satisfied? Tere is no way that this contract improved the relationship between the fire department and the mayor....to me, anyway, that sentiment is laughable. I'm surprised it continues to be reported as such. Sun, Mar 11, 2012 : 1:24 p.m.
Tue, Mar 13, 2012 : 4:03 p.m.
Tue, Mar 13, 2012 : 2:10 p.m.
Wow. Why would I have a reason to lie? Your disbelief shows that even you are as incredulous as I am by this realization, though... There are plenty of families that began with more than sufficient means to take care of themselves, and then found themselves struggling as costs increased and wages decreased. Even then, they are not &quot;pointing a gun to your head&quot;... The point that you might be missing though, is that we as taxpayers can pay people appropriately for the work that they do, or we can pay into social services that cover gaps (in healthcare, housing, etc ) that people can not finance themselves. Sun, Mar 11, 2012 : 11:34 p.m.
Sun, Mar 11, 2012 : 7:34 p.m.
Let's just put it this way, as soon as I became aware of what newly employed personnel would receive, I thought &quot;Snoopdog's relative certainly would no longer be interested in this line of work...&quot; haha. Seriously. My teenage children make almost as much (on an hourly basis) as a firefighter will make....the job was just greatly devalued. I'm sure that will be satisfying to some people, but really, for working class families it will be more of a struggle than it is already is. Thinking ahead, if families can not take care of themselves by earning a paycheck sufficient to meet basic costs, those needs still fall on taxpayers in other ways. Sun, Mar 11, 2012 : 6:21 p.m. While that may be helpful, this is an editorial. Maybe suggest they write an article. But as it the contract is similar to police officers, the information you want may already be available. Sun, Mar 11, 2012 : 2:27 p.m.
good question snoopdog. An informed populace is a good thing....no wait its a bad thing...maybe it depends on which side of the equation one falls on. Sun, Mar 11, 2012 : 1:10 p.m.
We have to continue to support our Fire Department as well as the Police Department. No more cuts in staffing, and actually staffing should be increased for both -- and they all should have the necessary equipment to perform their jobs in the most satisfactory way. Think the Police are doing okay in that area, but the Fire Department certainly needs some new equipment and I don't mean little pick up. I continue commend both departments for assisting in keeping our city and surrounding areas safe. Sun, Mar 11, 2012 : 7:26 p.m.
&quot;Now you just need to find some more generous souls like yourself ready to sacrifice personally...&quot; You can find them already - working at the fire department. Many Ann Arbor firefighters (themselves taxpayers, by the way) do not have what many other taxpayers have....but really, is that your criteria, Mike? Sun, Mar 11, 2012 : 2:53 p.m.
Sun, Mar 11, 2012 : 1:03 p.m.
&quot;Legislation at the state level to control employee benefit costs and reform the arbitration process for police and firefighters certainly contributed greatly to the city's ability to secure these new contracts. The result is a fiscal turnaround for the city and hopefully the end of an era of cuts in public safety.&quot; Thank you, Rick. So an &quot;editorial&quot; about Ann Arbor firefighters includes a mention of Commerce Guys (?) but no mention of the ladder truck debacle?